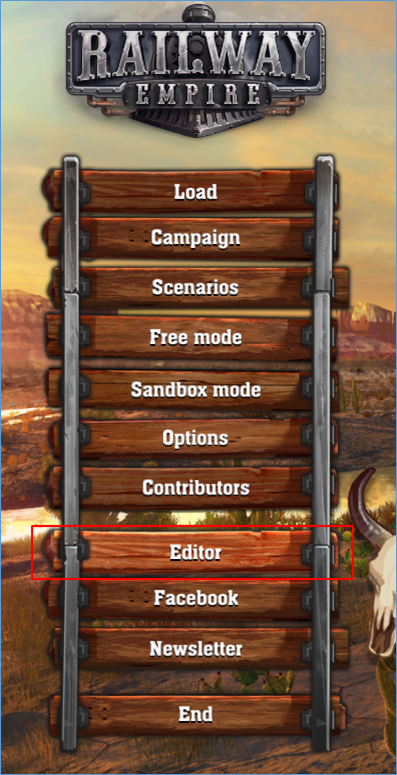 In the main menu of Railway Empire, there is a button called “Editor” which will lead you into the modding section of the game. There, click on the “+” button to create a new scenario. Besides, there is a “Manual” button in the bottom right corner which leads to this tutorial. After clicking the “+” button, can edit the general settings of your scenario. Enter your name and description here, which might show up later in the Steam Workshop. 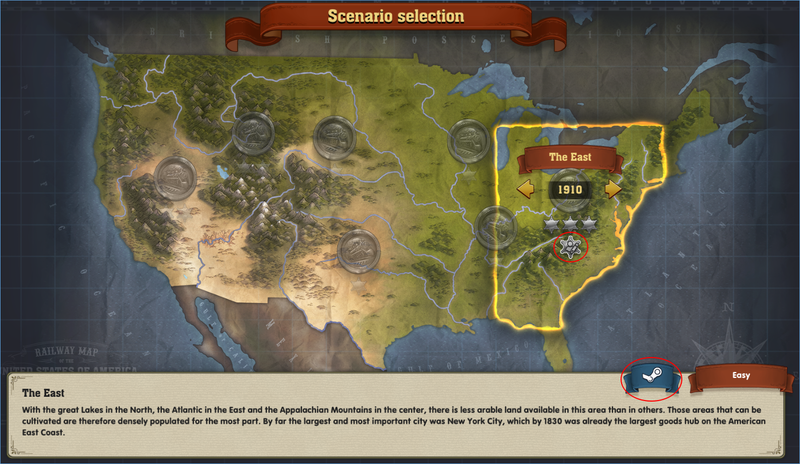 Additionally, you have to select a region, the era and the language of the scenario. 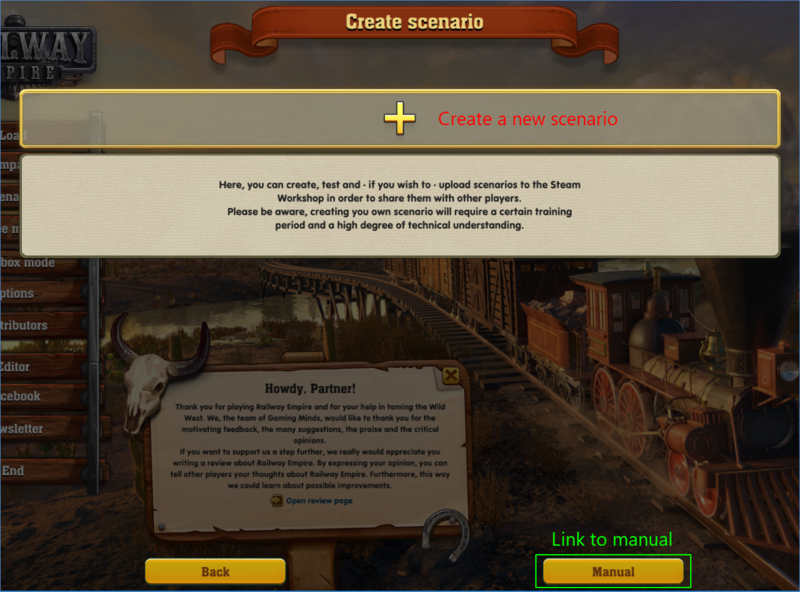 Confirm by clicking on “Create” (bottom right) and your scenario will be created. If you would like to create a backup, you can simply copy the whole folder or only the (Tiled) *.tmx and (Tome) *.tproj files to another directory. So, in case of an emergency, you can replace the corrupt data. It is recommended to test your scenario before uploading it. In a similar manner, it should be wise to check your scenario for possible errors (4). 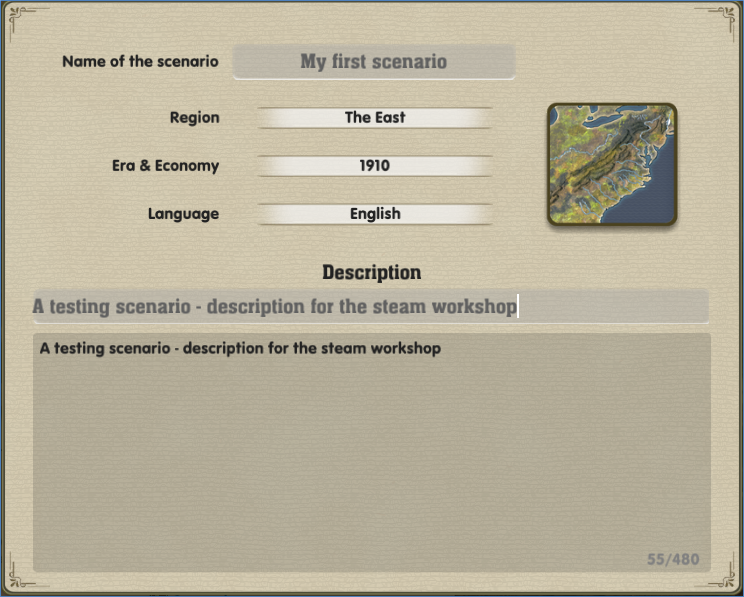 As soon as you have uploaded your scenario (7), you are able to find it in the Steam Workshop (http://steamcommunity.com/app/503940/workshop/). You can identify custom content by the Steam attached to it. Please keep in mind that we will not test those scenarios and thus, we cannot guarantee their integrity.